This is wholly modern post-bop jazz, but there is something very old-school about Yul. It’s like those classic Blue Note recordings where nothing groundbreaking was going down, but everything about the music was exciting. Because if you get four musicians together who know how to trade volleys and honor a well-crafted melody when its presented them, and have as much fun comping a solo as they do riding one off to the horizon, well, it’s an electrical jolt that keeps you hitting the play button. Bassist Alex Lefaivre gets that done on Yul, along with drummer Mark Nelson, guitarist Nicolas Ferron and an exceptional contribution from alto saxophonist Erik Hove. Everyone sounds like they walked into the recording studio feeling at their best and ready to light things up. Music from Montreal, Québec. 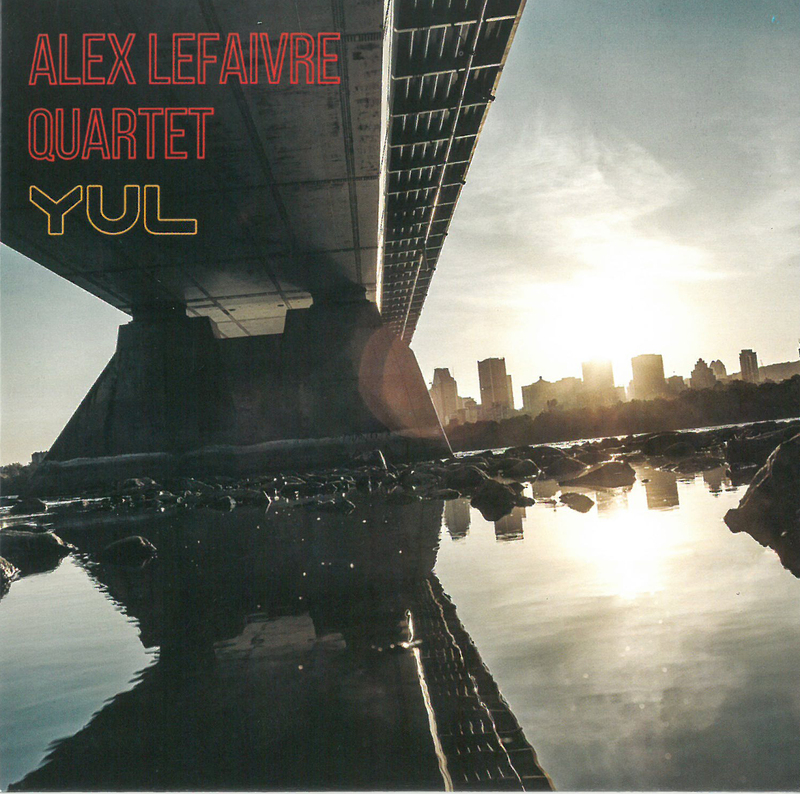 YUL, a new release from bassist/bandleader Alex Lefaivre, is a modern jazz album whose compositions take inspiration from the “dreamy, hazy summer vibes” and “gritty, metropolitan edge” of Montreal, the city in which Lefaivre is based. For those unfamiliar with Lefaivre, he has been an active member of the Canadian music scene for well over a decade, both as part of the award-winning Parc X Trio, and as a founding member of the independent jazz label Multiple Chord Music. Joining Lefaivre on YUL are Erik Hove, alto saxophone, Nicolas Ferron, electric guitar, and Mark Nelson, drums (Lefaivre plays electric bass throughout). It speaks both to the open quality of Lefaivre’s compositions and to the group’s instrumentation that there is ample room for each player’s individual voice to come through clearly, and, consequently, for a compelling group dynamic to emerge. This is certainly the case on the album’s first track, the medium-slow 3/4 time The Righteous, which features dynamic solos from Ferron and Hove, set atop patient, supportive comping from Lefaivre and Nelson. Even during YUL’s most bombastic moments – such as the breakbeat-heavy song The Juggernaut – there is considerable attention to balance and to dynamic detail. The album closes with the title track, a 5/4, straight-eighths song that contains some of the most exciting moments of the outing from all four band members, including a short, memorable drum solo from Nelson. YUL is a cumulative success – reflecting Lefaivre’s mature, cohesive musical vision. It’s an axiom of jazz that any piece is fundamentally determined by the personnel performing it. One particularly good instantiation of that principle is YUL, an eight-track set of modern jazz written by Parc X Trio member Alex Lefaivre and performed by the electric bassist with alto saxophonist Erik Hove, guitarist Nicolas Ferron, and drummer Mark Nelson. Conceived as a love letter of sorts to Montreal (the title of the album, which was recorded on January 18, 2018 at the Boutique du Son studio, references the city’s airport code), the release draws for inspiration from Lefaivre’s beloved home town, a city celebrated for its beauty and cultural vitality; renowned for its annual jazz festival, Montreal attracts musicians from far and wide, many of whom decide to stay after savouring its abundant charms. Considerable contrasts are evident, with some pieces ballad-like (“Nostalgia”) and others fiery (“Cascade”). Lefaivre largely eschews breakneck tempos, which allows the listener to better appreciate the interactions in play. In some cases, marked fluctuations in dynamics occur within a single piece, such that “Estelle,” for example, alternates between ponderous and energized episodes. YUL favours a jazz style more connected to instrumental rock and fusion than traditional swing, though the quartet’s playing isn’t characterized by the rawness associated with rock, each of the four opting for a refined, distortion-free attack that’s easy on the ears. That doesn’t mean, however, that the group isn’t capable of generating heat when the material calls for it. In an inspired move, the album’s sole cover isn’t something on the order of “All the Things You Are” (not that that would be objectionable, necessarily) but rather a treatment of John Carpenter’s “Halloween,” its theme originating from his cult-classic 1978 horror movie. Naturally ominous in tone, the material unfolds methodically, with Hove and Ferron initially anchoring the performance by focusing on the melody as Nelson extemporizes liberally. The scene set, the saxophonist departs from a straight voicing of the theme for an explorative solo, which the guitarist matches in his own expansive turn moments later. There’s a very specific synergy and chemistry that arises in the interactions between the four individuals on YUL. Had any one of them been substituted by another musician playing the same instrument, the album result would have been significantly different in character. As strong as Lefaivre’s compositions are, melodically and otherwise, it’s their realization by this particular foursome that is the greatest difference-maker. Canadian bassist Alex Lefaivre creates a series of impressionistic landscapes with his pastel-toned team of Erik Hove/as, Nicolas Ferron/g and Mark Nelson/dr. Lefaivre’s pen is as subtle as his bass, creating reflective material for Hove’s fluffy alto to float like a cirrus cloud during gentle material such as “Nostalgia” the reflective “The Righteous” and contemplative title track. The team shows muscle as Lefaivre’s bass line digs a trench on the mechanically pulsed “The Juggernaut” while he leads the tender dance for Ferron’s guitar on “Cascade.” Nelson’s brushes are dainty on the subdued “Halloween” with the overall mood being as reflective as a stroll in Givenchy Gardens.